Jay and I put our garden to rest for the year. We spent a beautiful October day in our community garden preparing a bed to plant garlic and harvesting the last of the herbs. Last week I prepared a large piece of cardboard according to a wonderful schematic that I learned during my garlic class a few weeks ago. The piece of cardboard was conveniently the width of the bed where I wanted to plant garlic, and I measured out and cut holes in a alternating pattern which facilitated making sure the garlic cloves were spaced evenly. 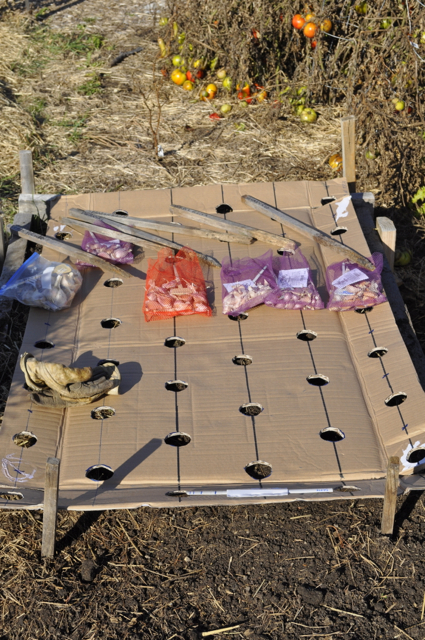 Practically speaking, however, we found ourselves picking the cardboard up to dig a hole or place the clove and we finally decided that a string stretched the length of the bed with marks at the appropriate spaces would be easier to work with. I hunted down some bale twine (it's lying all over the garden) and grabbed a black magic marker and tape measure that I always keep in my car and we quickly made a planting guide. Our garlic is five inches apart in rows (I split the difference between the recommended four to six inches), rows six inches from one another. This year we planted six different types of garlic. I bought four new seed stock, and planted seed stock from two varieties we grew this year. We buried the whole thing in hay and it's now nice to think that something wonderful and green will come up early next spring. 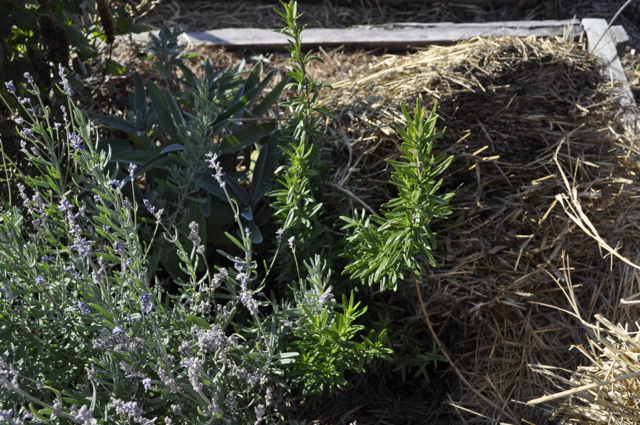 We also harvested a little lavender, most of the rosemary stems, and all of the anise hyssop, and buried the whole thing in a heavy layer of hay mulch to keep it from freezing and thawing next spring. I have not had much luck overwintering Rosemary indoors or lavender outdoors, and am hoping that this helps. I am pretty sure the winter will kill the rosemary but the lavender has a fighting chance. The herbs went into the dehydrator, and Jay made a tea out of the anise hyssop after dinner. Absolutely aromatic and wonderful. When I dropped things off in the compost pile I found a stalk of brussels sprouts. The brussels sprouts were small, I'm sure that's why a gardener threw it away. But what that Gardner did not know is my delicious recipe for cabbage soup that also can use brussels sprout plant leaves. Here's a link to that recipe in case you have cabbage or brussels sprouts that you want to cook up. We made it for dinner. Delicious. I work for American Family Insurance headquartered where I live in Madison, Wis. We just started a customer-facing blog and I was asked to write a post about my experience with our corporate community garden. Thought you'd like to see it. This spring, seven gardeners moved 150 bales of hay one night to make way for our 2012 garden expansion. I'm now ready to do the last bit of garden work before leaving it alone until next spring. It's time to plant garlic! I ordered four new varieties of garlic from Territorial Seed Company, and am going to plant them and some cloves from the garlic I raised myself this year. I bought 8 ounces of each and will plant 30 cloves. This left me with some leftover which I am going to sell to a friend who didn't get her order in time (they're all sold out of the 2012 seed stock). Read more about planting garlic. I took a photo of a healthy looking clove and one of these discolored clothes, and I also found an image online with a similar comparison. Samples from my stored garlic, discovered Oct. 14 while preparing some for seed. The "waxy" sample on the left, and you can see it starting on the top of the "good" clove on the right. An image from the Oregon State University Extension. This article says that there isn't much that can be done about it, but what I want to know is can I eat them? I'm certainly not going to plant these inferior-looking cloves, but I'm distressed that all of this wonderful garlic may be going bad while I'm storing it to be eaten! Anyone else experience this? Your thoughts? Thanks for your ideas and suggestions.